We are centrally located in Bellevue, Washington state. Our building is about 6,000 square feet with air conditioning and first class facilities. Small class sizes offer best learning environment and ample personal attentions. A playground in the backyard provides a safe and fun place for recesses. 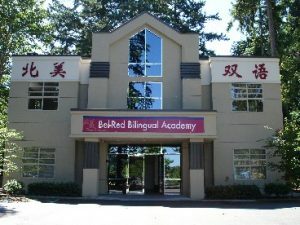 The teachers at Bel-Red Bilingual Academy have been carefully selected and are the most qualified with great passion for early child and elementary education. All teachers, from Junior K to 3rd grade classes have Washington State Teacher’s Certificate, and either Master Degree (60%) or Bachelor Degree (40%). The preschool and pre-k teachers have either Bachelor Degree or Early Child Education certificates. Every year, the teachers take the continued professional training and education to meet the State requirements. 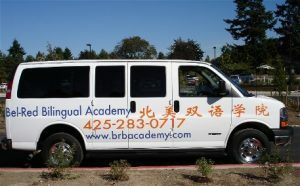 All of our Chinese teachers have at least Bachelor Degree with standard Mandarin language and are fluent English skills. Not only all the students have the best instructors in the classrooms, the overall environment at this institution provides a stimulating atmosphere for learning in all aspects. Your children experience novel teaching methods along with time-tested techniques in our school. They participate in the activities that stimulate their senses and cultivate their intelligence. It will be an experience that benefits their whole life! School uniform is required Monday through Thursday, except Friday and Holidays. Click here for more detail and order instruction. We provide shuttle service for student field trips.